WATERLOO — The National Day of Mourning, an annual ceremony to grieve for workers killed or injured on the job, was more sombre than usual on Monday in Waterloo. Nick Lalonde, 23, of London fell to his death last Oct. 11 while doing masonry work at a Waterloo condo site. Three months later, Chris Crawford, 33, a sheet metal worker from Kitchener, died when a roof collapsed while he was helping built a Target store in Mississauga. “We meet again and again and again — so sadly — to honour those wounded and murdered at the workplace, to mourn for our dead and fight for our living,” Rev. Oscar (Oz) Cole-Arnal, a Waterloo anti-poverty activist and ordained minister, told the crowd of about 150 workers, union leaders and politicians. 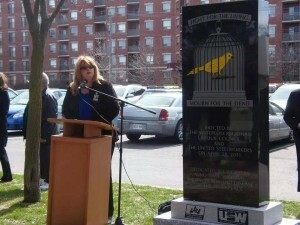 Waterloo Mayor Brenda Halloran paid tribute to the two construction workers. “More work needs to be done and I thank you all for being here today and for your continued work in ensuring no more lives are lost, no more injuries occur and no one else is hurt at their workplace,” she said. Kim Valliere, health and safety co-chair with the Waterloo Regional Labour Council, said employers must be held accountable. 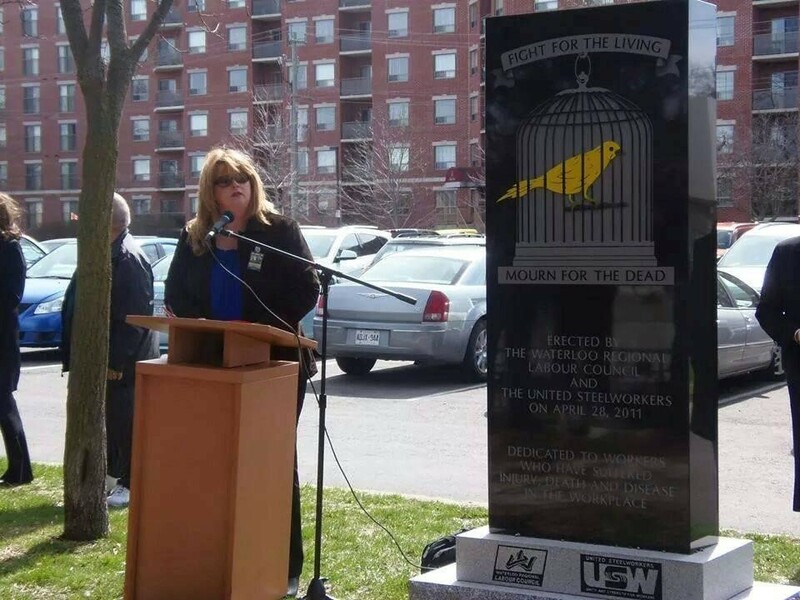 Seventy-three people died in Ontario workplace accidents in 2012, Kitchener-Waterloo NDP MPP Catherine Fife told the crowd at the Workers’ Memorial outside Waterloo City Hall. Elizabeth Witmer, chair of the Workplace Safety and Insurance Board (WSIB), said 243 people in Ontario were killed at work or died from occupational diseases in 2013. “When I told my husband last night about that number — 243 — he was absolutely flabbergasted,” she said. A vigil for Crawford was set for Monday night in Victoria Park. Although the annual Day of Mourning pays tribute to people killed or injured on the job, politics was in the air Monday. After Witmer spoke, Cole-Arnal took Witmer’s WSIB to task. Witmer, a former Kitchener-Waterloo Conservative MPP, was appointed by the Liberals to the WSIB in 2012 and makes $188,000 a year. Standing about six metres from Witmer, Cole-Arnal called on the crowd to sing the union anthem Solidarity Forever. “And honestly I’d like to ask all the people here, unless you believe in what we’re singing, don’t sing,” he said. Witmer didn’t sing immediately but was mouthing the words at the end of the song. The NDP’s Fife criticized the governing Liberals. Fife began investigating workplace safety after Lalonde, who wasn’t wearing a harness, fell from the roof of a building that had no guardrails. The labour council has asked police to investigate the death. Fife said she quizzed the government during question period and launched a petition. In December, the Liberals announced the training standard was enacted. “It shouldn’t take shaming the government into doing the right thing,” Fife said. There was an awkward silence for 13 seconds when the labour council called on a representative of Kitchener-Waterloo Conservative MP Peter Braid to address the crowd. No one came to the podium. “OK, maybe someone’s running a little late today,” Valliere told the crowd. Liz Seymour, Braid’s executive assistant, said later that the no-show was due to “strictly a miscommunication.” She said Braid spoke at last year’s ceremony but couldn’t make it this time.